Conn Ryder was drawn to and garnered praise for her art from an early age. But it was an incident during a high school drawing class that expanded her way of thinking about art. Assigned to create a pencil drawing of a shoe, Conn sorted through a box of old shoes and, after choosing a clean white Keds sneaker, tied the laces in a neat bow and began sketching. Noticing this, her teacher lunged toward her desk and heaved the sneaker across the room where it hit and bounced off the wall. He wildly dug through the box of shoes, eventually pulling out an oversized, raggedy, high-topped basketball shoe with the tongue half ripped off and shredded shoelaces. He slammed the tattered shoe down in front of Conn and said "Draw this! This shoe has character!" Conn created the best drawing she had done to date and received an A+ for her efforts. More importantly, she walked away with a lesson in seeing the character, interest and beauty in the least obvious places. Two paintings were featured in a home renovation reveal on an episode of the DIY Network show "Bargain Mansions," November, 2017. Artist Spotlight - City of Brighton Eye for Art Program for the week of Nov. 9, 2015; Denver Post Hub article. Featured Artist - "Abstract Art. Daily Artsy Paintings" on The Artsy Forager; Sept. 2, 2015. Conn's formal art education includes fashion illustration at the Art Institute of Fort Lauderdale and painting at the Kansas City Art Institute. Once during college, Conn's instructor led a group of art students into the painting studio to show them a large vibrant abstract Conn was working on. The instructor pulled the painting out of the storage slot, only to discover the previously colorful canvas had been covered with thick, black paint. Conn later explained that out of frustration, she painted the entire surface black, and in doing so, freed herself from the creative fetters of the previous image. The next afternoon, she feverishly scraped back into the black surface, reworking areas as she went and uncovered a more complex and texturally varied abstract that suited her sensibilities. The instructor said she knew then that Conn was a true artist. Conn later turned to representational painting, attending painting workshops with Daniel E. Greene and Joan Potter. She sold her representational still lifes and received portrait commissions, but as other aspects of her life began to take over, Conn's artistic pursuits became sporadic at best or placed on the back burner altogether. Though the course of her artistic evolution zigzagged through fashion illustration, representational art and at times was suspended, by age 50, Conn found her way back to the abstract painting that resonated in her core. Since that time she has painted with dedication to cultivate her own unique artistic voice. 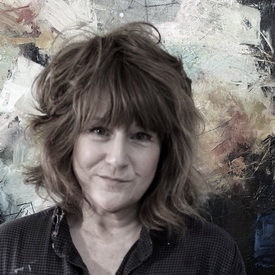 Her abstract paintings have been included in regional, national and international juried exhibits, and are in corporate collections throughout the United States. Conn’s work has been presented in multiple solo and invitational group exhibitions, including the prestigious Colorado Women in Abstraction exhibition at the Center for Visual Art in Denver, Colorado. She was a feature artist in Acrylic Artist Magazine Winter 2016 edition and two of her works appeared in the DIY Network show "Bargain Mansions" in 2017. Conn is currently represented by galleries in Atlanta and Des Moines. I paint from the gut. For me, abstract painting is a personal exploration. Through the painting process, I turn myself inside out, in a sense, to transform my emotional realm into a perceptible domain. My expressive work is the discernible manifestation of my core language - brought forth from internally assimilating, then outwardly fashioning the emotional response to the experiences, observations and backdrop of my life. I convey that emotional essence to an observable platform by way of a painter’s lexicon - color, form, space, texture, line, movement - and finesse those elements much like seeking the right piece to complete a puzzle. As I fill a blank canvas with an onslaught of arbitrary paint strokes, splashes, drips and mark-making, that essence comes to the fore as the image begins to, in a sense, speak to me - at turns beguiling and confronting me. An exchange of sorts unfolds, as I get immersed in a rhythmic blur of advance and retreat, flow and stagnation, defiance and submission, discord and collaboration. I search for that moment of sensing synchronicity between how I feel and what has been revealed on the canvas. A visible fusion of the emotive exchange materializes and I realize the canvas was an analyst, a mentor, a gadfly, a cohort - and ultimately a mirror to my emotional nature. My hope is that if I’ve created a painting that feels authentic and impactful for myself, that someone else may recognized some hint of their own emotional nature in the work and that it may touch them in the same way that a particular song can reach deep or a moment in nature can feel harmonious.